This article is about the Italian Fascist paramilitary. For other uses, see Blackshirts (disambiguation). The Milizia Volontaria per la Sicurezza Nazionale (MVSN, "Voluntary Militia for National Security"), commonly called the Blackshirts (Italian: Camicie Nere, CCNN, singular: Camicia Nera) or squadristi (singular: squadrista), was originally the paramilitary wing of the National Fascist Party and, after 1923, an all-volunteer militia of the Kingdom of Italy. Its members were distinguished by their black uniforms (modelled on those of the Arditi, Italy's elite troops of World War I) and their loyalty to Benito Mussolini, the Duce (leader) of Fascism, to whom they swore an oath. The founders of the paramilitary groups were nationalist intellectuals, former army officers and young landowners opposing peasants' and country labourers' unions. Their methods became harsher as Mussolini's power grew, and they used violence and intimidation against Mussolini's opponents. In 1943, following the fall of the Fascist regime, the MVSN was integrated into the Royal Italian Army and disbanded. The Blackshirts were established as the squadristi in 1919 and consisted of many disgruntled former soldiers. It was given the task of leading fights against their bitter enemies – the Socialists. They may have numbered 200,000 by the time of Mussolini's March on Rome from 27 to 29 October 1922. 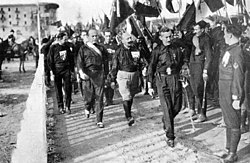 In 1922 the squadristi were reorganized into the milizia and formed numerous bandiere, and on 1 February 1923 the Blackshirts became the Volunteer Militia for National Security (Milizia Volontaria per la Sicurezza Nazionale, or MVSN), which lasted until the 8 September 1943 Armistice of Cassibile. The Italian Social Republic, located in the areas of northern Italy occupied by Germany, reformed the MVSN on 8 December 1943 into the National Republican Guard (Guardia Nazionale Repubblicana, or GNR). The terms after the first are not words common to European armies (e.g., the Italian battaglione has cognates in many languages). Instead, they derive from the structure of the armies of ancient Rome.